While Russians are clamoring for easier travel to the EU, the European electorate fears an increase in migration. BRUSSELS—The bilateral agenda between Russia and the European Union has essentially been reduced to one item: short-term visa-free travel. The reasons are clear. First, the visa problem is something the public can understand more easily than the WTO, European energy security or the framework agreement. Second, unlike in the 1990s, many Russians are discovering the world and can afford to pay for it. Third, it is an internal political issue that has to do with national prestige. Unlike Ukraine, Moldova or Georgia, for example, Russia will not settle for anything less than the mutual abolition of visas. Many Russian experts consider Moscow’s persistence to be mainly a populist gesture. Getting a multiple-entry Schengen visa today is no problem for businessmen, bureaucrats and politicians. The current visa facilitation agreement makes it easy to obtain visas, even multiple visas, for those involved in scientific and cultural exchanges, journalists and relatives of EU citizens. And holders of diplomatic passports can travel to Europe without a visa. So on the Russian side, the main group affected by visa policies is tourists who choose to go abroad for their annual vacations. The mood in Brussels, however, is not in favor of visa-free travel for Russians, and it is partially a matter of bad luck and bad timing. Russia is not an attractive tourist destination for most Europeans, so visa-free tourist travel is not a major concern for EU negotiators. Then, the likelihood of visa-free travel between Russia and Europe was diminished by the opening of Schengen zone borders for the holders of biometric passports from Serbia, Montenegro and Macedonia (late 2009) and then Bosnia and Herzegovina and Albania (late 2010). A large number of people migrated to Europe after these policies were enacted. Guy Trouveroy, the Belgian ambassador to Russia, fed the fears that visa-free travel for Russia would lead to more migration when, in an interview with the Russian News Service in early April, he claimed that the main reason the EU is not interested in abolishing visas is that Europe is afraid of an influx of refugees from Russia’s problematic North Caucasus and Abkhazia, whose residents hold Russian passports although officially the EU considers them part of Georgia. More recently, illegal migration from strife-torn North Africa via Turkey has increased. And Europeans continue to face economic problems and budget cuts, which makes the electorate less welcoming. At the Russia-EU summit in Rostov-on-Don last summer, President Dmitry Medvedev proposed a draft visa-waiver agreement to which no coherent answer has yet been given. “No deadlines have been set. Like in any dialogue, everything depends on both sides, on their response and their efforts,” said a spokesman for European Interior Affairs Commissioner Michele Cercone. According to Vladimir Chizhov, Russia’s ambassador to the EU, within the EU, only those countries whose economies are interested in the inflow of Russian tourists want the negotiating process to accelerate. Others are being cautious or even oppose visa-free travel now and for the foreseeable future. In Chizhov’s opinion, work is proceeding on two parallel tracks. The first is the complete abolishment of visas. On this front, a meeting of senior officials who are working out a list of “common steps” has just been held in Moscow. The second track is visa liberalization. This has to do with assessing compliance with and improvement of the 2006 agreements on visa facilitation and re-admission. 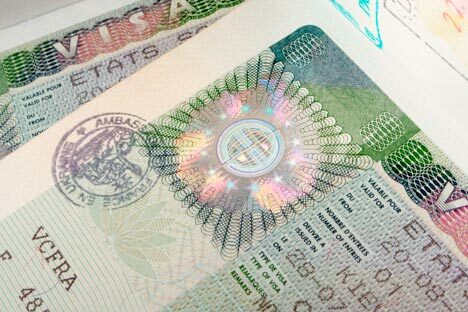 “There are a number of proposals that expand the practice of the issue of multiple-entry visas, simplify other procedures, systematize the list of documents a traveler has to submit,” said Chizhov. Of the two tracks of negotiations between Russia and the EU, the track of visa facilitation appears to hold out more promise than the establishment of a visa-free exchange. The diplomats who are familiar with this work say that it is proceeding slowly but steadily. There are a host of technical problems that cannot be solved quickly. Dealing with them alone would take at least three years. Russia and the EU have “common steps,” but so far, no road map toward a visa-free system has been drawn up. And chances are that even if one appear, it will set no deadline. Alexander Mineyev is a Brussels-based correspondent for Novaya Gazeta.